Prepare to have new desktop background. No, that isn't concept art for the new Mass Effect game, or a shot from The Force Awakens. What you see is a still from a video released earlier today by NASA showing off the very surface of the sun in glorious 4K high-definition. 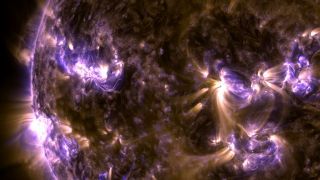 Dubbed "Thermonuclear Art, " the video was created by NASA's Solar Dynamics Observatory, which captured images of the sun emitting different wavelengths every twelve seconds. Multiple phenomena, from sunspots to solar flares, are clearly visible as the camera rotates around the fiery sphere. The way the surface burns with brilliant blues, reds and purples looks something from out of science fiction, making it all the more impressive that it's captured in real-life at a stunning 4K resolution. For those without 4K-enabled monitors, the YouTube upload also goes up to 1440p resolution. NASA also boasts that the images shown were captured at a resolution eight times greater than HD video. The Solar Dynamic Observatory, launched in 2010, provides 24/7 coverage of the sun to better understand the celestial body, the energy it emits, and its impact on our planet and solar system. You can find other videos created through its observation on NASA Goddard's YouTube account, to include a photobombing of a lunar scale.